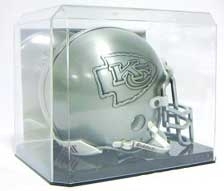 Designed for the Minis, this Football Helmet Display Case is the perfect way to display your brand new Mini helmet. Stackable, with a mirrored back, this product will show off your collectible treasure! Mini helmet is not included.